I had a lot of ideas for this post. I could have legitimately framed my 2010 as the year of Amtrak, the year of travel, or the year of learning how to stick with things that are hard. But really, this site is the one thing that defines my 2010. Heck, I went through a period where I was dedicating my yoga practice to CoLab Radio, and I don’t even like yoga. We launched this blog in Cartagena, Colombia last January, and stumbled through the rest of the year finding out what works and what doesn’t. The goal for 2011: more posts that describe places from the perspective of people from those places. The post featured in the photo above is A Tour of Sister Safiyah’s Community Garden in North Philly. Sister Safiayah Abdullatif took all of the photos for her post. They’re as beautiful as her garden. Post by Alexa Mills. This post is part of the 2010 Year in Review series. Anyone is welcome to submit a post by emailing colabradio@mit.edu with your text and image. Alexa, you have done an amazing job. Thanks for giving me something to look forward to reading all year. Here’s to another great year! Agreed! 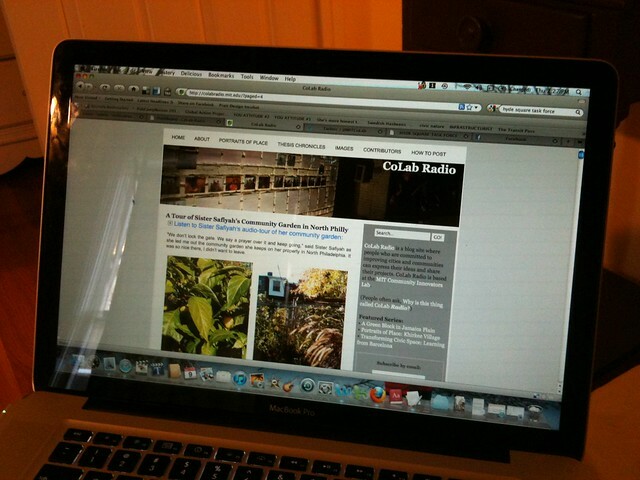 CoLab Radio is my favorite blog!